Our outdoor Lamp Post Banners can be printed from files created in any of the common graphic design programs, or we'll do the graphic design for you. We print full color banners on either matte or glossy finish vinyl that gives vibrant color. 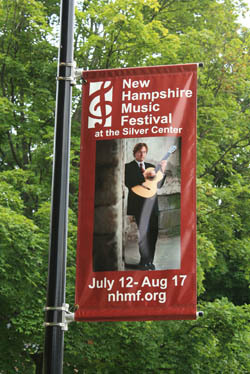 Our Lamp Post Banner price includes hem around the edges and pole pockets top and bottom. If you need to buy the mounting hardware, we can help with that too. When you need attractive full color Lamp Post Banners, give us a call! What we love about our full color banner printers is that we can send files to it from all of the programs that we support. 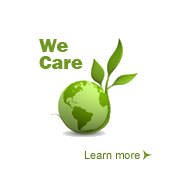 There's no proprietary vinyl cutting software, and no cost of screens or separations. We output to it just like we do our other inkjet printers. Our full color banners are printed at a photo quality 720 dpi on 6 color eco-solvent equipment that gives you accurate colors and stunning graphics. Give us a call! Our online ordering system does not accomodate lamp post banners. Lamp Post Banner pricing, based on total square feet of your order. Remember that most are two sided, so a 2x6 banner has 24 square feet total area. We can also furnish the hardware for your Lamp Post Banners. Give us a call to discuss.